For 10 years the Lyson name has been synonymous with the fine art industry. Over this time the printer technology may have changed dramatically, but for the fine art professional the choice of digital materials has remained the same. Whether your requirement is for dye or pigment-based inks, for acid-free archival media, or for print finishing products. Lyson® inks provide the same performance as OEM inks, at big savings. And they’re manufactured by Nazdar®, a trusted name that stands behind every drop with an equipment and application warranty. Discover the difference in Lyson value today! Don’t believe the negative hype regarding third-party ink. Nazdar has over 88 years of ink manufacturing experience to go along with second-to-none technical assistance. 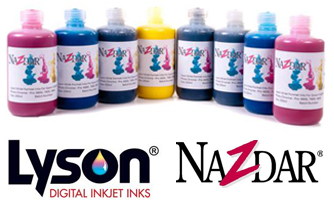 You can rest assured, switching to Nazdar Lyson ink will put money back in your pocket and your production won’t skip a beat.